Chicago's BFOC launches new site! Chicago is a city of intrigue. A city of beauty, yet a city of harsh realities, both social and climatic. A city so alluring… so exciting… and the home to numerous social, artistic and historic attractions. These attractions draw many millions of people a year and you will find many gathering at the hot spots around the city to partake in a plethora of activities… one of which is chess. Since most Chicago chess players have a high appreciation of aesthetic beauty, you will find them "locking horns," in many of these popular places… on the lakefront, at the beach, in public parks, jazz clubs, coffee shops and on the streets. Despite the spat in Hype Park (which resulted in banning chess players from a popular area), chess activity continues thrive… as it should. While tournaments are mostly held outside of the immediate Chicago area, casual games are to be found around town. In the past 25 years, several strong players frequented these chess "watering holes" to engage in fierce blitz battles. Dozens of players would enjoy an afternoon (and night) of fierce competition and put their egos and money on the line. 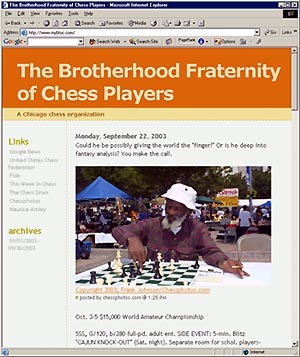 One group became a loosely-organized group known as "The Brotherhood Fraternity of Chess Players," or the "BFOC." John Porter has recently launched a BFOC website and will be aided in this effort by Frank Johnson who now resides in Atlanta, Georgia and works as a photographer. Check it out! 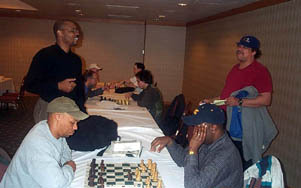 BFOC Members at 2003 Chicago Open: Frank Johnson (seated left) blitzing with Kent Williams while John Porter (standing left) chats with Tyrone Lee.